Presented by the Arts Division’s Institute of the Arts and Sciences in collaboration with the Arboretum and the San Jose Museum of Art, this will be the West Coast debut of FOREST, which was originally commissioned for Documenta 13 in Kassel, Germany. 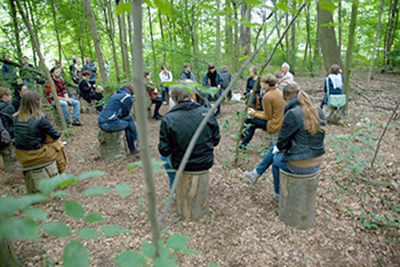 The installation employs sound to evoke history, memory, sensation, and site, exploring what you might hear in a forest over hundreds of years. The artists use a technology known as Ambisonics, developed by a mathematician nearly 50 years ago, which enables them to create a three-dimensional sound field out of various noises, vibrations, or explosions that they have collected and recorded. The sounds range from the gentle calls of wildlife on a forested Canadian island, to the loud clamor of historical re-enactors on a European battlefield. Weber noted that he has previously worked with the two artists at SFMOMA and at the Tang Museum before he came to UC Santa Cruz. "A remarkable thing about Janet Cardiff and George Bures Miller's utterly captivating sound installation is how it blurs distinctions between site and art. You enter a clearing in the forest, sit down on a wooden stump, and simply listen. Cardiff and Bures Miller's work incorporates the actual forest into an audio composition emitted from more than 30 speakers. Sometimes there is a near synchronicity of natural and mediated sounds, and it's tough to discern what is live and what is recorded...In turn frightening and deeply touching, ominous and serene, Cardiff and Bures Miller's forest soundscape is a wonder." 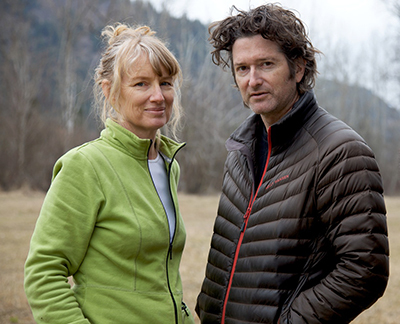 Cardiff and Miller are internationally recognized artists known for their immersive multimedia sound installations and their audio and video walks. Their recent solo exhibitions include: 21st Century Museum, Kanazawa, (2017); ARoS Aarhus Art Museum (2015); and Museo Nacional Centro de Arte Reina Sofia, Madrid (2015). Their recent group exhibitions include Being Modern: MoMA in Paris, Fondation Louis Vuitton, Paris (2017); and the 19th Biennale of Sydney (2014). In 2011, Cardiff and Miller won Germany’s prestigious Käthe Kollwitz Prize. They also represented Canada at the 2001 Venice Biennale, winning the Biennale's Premio Speciale and Benesse Prize. A free public opening of FOREST (for a thousand years...) will take place on April 7, with a reception from 3 to 5 p.m. at the Arboretum, featuring remarks from the artists. The exhibition will then be open to the public until June 30, Tuesday-Friday from noon to 5 p.m., and Saturday-Sunday from 10 a.m. to 5 p.m. Admission to FOREST is included in a visit to the Arboretum and Botanic Garden. For more information, visit the Institute of the Arts and Sciences web site.